Think Micro-chipping your pet will be a guarantee to get your missing pet back if they’re found by a shelter ect, think again. Here is just one of many stories like this that shows microchipping your pets means nothing if those who find them do not act honest & do the right thing. There needs to be a universal database & where a new owner has to show a legal contract to be allowed to change microchip information, also shelters should not be allowed to have their information added with the way corrupt shelters are stealing & flipping pets. MINNEAPOLIS – There’s nothing like getting that phone call telling you something you’ve lost has been found. However, for Portia Miller, it wasn’t that simple. A voicemail in May from Minneapolis Animal Care and Control told her they had her dog, and she could pick him up. But when she got there, they told her there is another registered owner. Portia bought Mercutio — her Bichon Shi Zhu mix as a puppy in 2007. That dog helped her cope with the loss of a friend. He helped her grow up. “He gave me responsibility. I always wanted to be home and be with him,” Miller said. And six years later in April 2013, Portia says that dog was stolen. 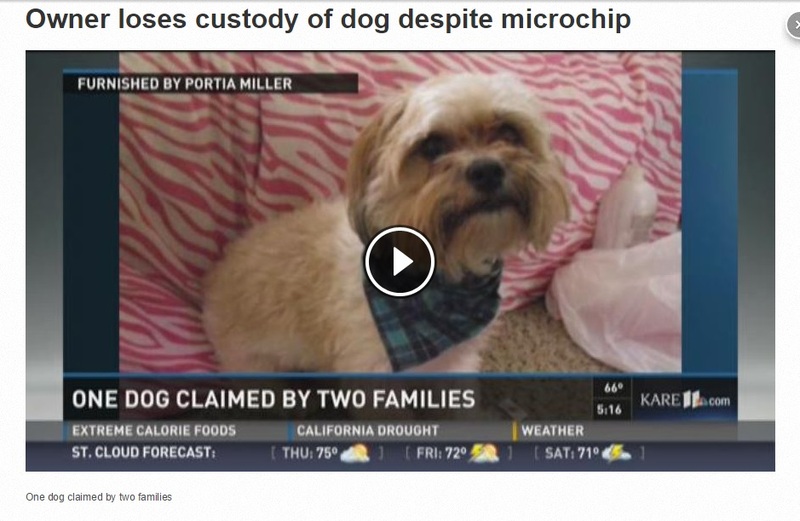 Like many pet owners, Portia had paid for and registered an ID microchip. “They’re supposed to scan dogs for microchips. And my information is supposed to pop up. And it’s supposed to say this dog is missing,” Miller said. But that system failed her – twice.